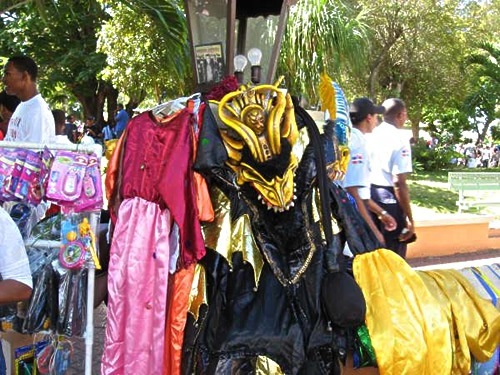 Los Diabolos costumes in La Romana, Dominican Republic. The little boy grips his mother’s hand and stares hard at me. He slides his sunglasses down, and two Hershey’s kisses appear above the rims. They start early here, I think, feeling flattered even though he is only four years old. 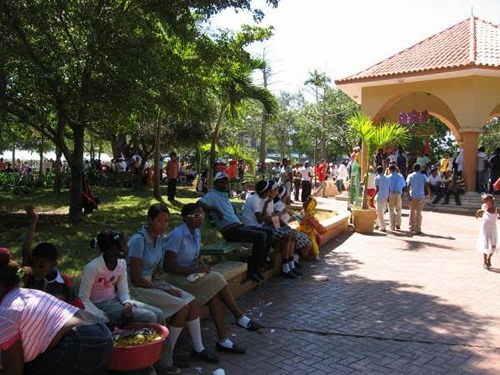 I sit drinking soda in the main plaza of La Romana, Dominican Republic. It is early, but today is Carnival and already crowds start to form. Pockets of teenage girls laugh conspiratorially. Boys act cool, pretending not to notice. 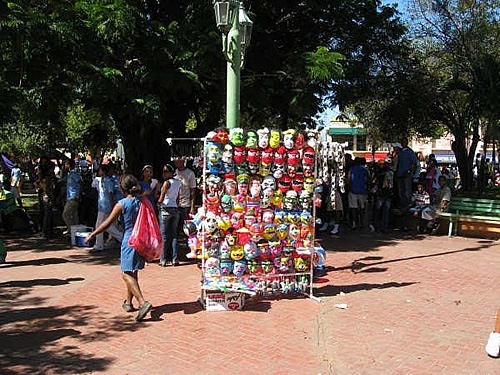 Street vendors do brisk business, and the Presidente (beer) stands have been up since yesterday. Crowds waiting for the Carnival to begin. Back in the U.S., I was suffering from major fuku (bad luck): troubles with work and nowhere-going relationships. Drastic measures were needed. A friend told me to head in the direction of La Romana, where his family has a house. 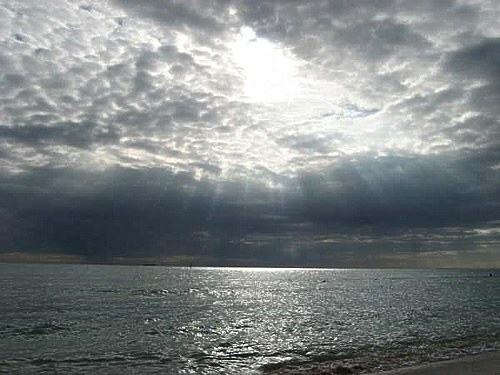 In the Dominican Republic some say that if life is going lousy, then a dip in the ocean will wash away the bad spirits. I head to the beach in Bayahibe. 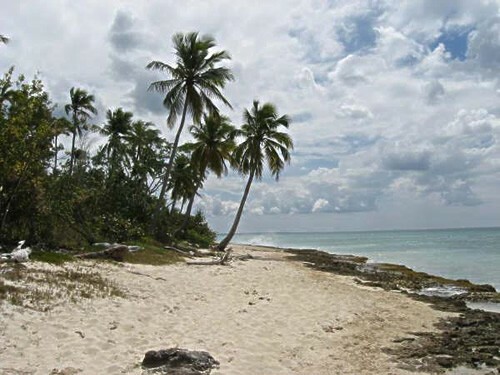 Bayahibe is a small strip of a town on the edges of the Parque del Este. The town borders empty palm-lined beaches, a national forest, and a sea so blue it hurts the eyes. I wade shoulder-deep into the water, waiting for it to work some magic, and stay until the day’s last light fades away. At night lights sparkle by the shoreline. Are these nimitas (firefly-like beings that are actually the souls of the dead watching over their loved ones)? I could use their help. One day, I cram myself into a guagua (collective cab), and head to La Romana for Carnival. The picher, who helps everyone pile in, flips down a wooden seat behind the driver and more space miraculously appears. It is February, the dry season, and we drive through scrubby countryside, not the vigorous jungle that I had imagined. Cactus pokes stubbornly through the brush. Fires dot the roadside and smoke obscures the asphalt. We pass an open air butcher shop, a slab of meat hanging from a hook in the center. It reminds me of Africa where meat is sold the same way, sin refrigerción. Either it is fresh or it is not, no disguising the fact. Yet I do not feel far from Washington Heights/Inwood, the Dominican area of Manhattan where I live and which has given me an introduction to things Dominican. In the guagua I talk to my sister on my cell phone with reception as if I was back in the Washington Heights. And I could swear the girl in front of me is wearing a tank top I saw last summer in a store on the corner of Broadway and W. 178th. But still there is a lot to learn about Dominicans, starting with the language. I have little trouble understanding Mexican Spanish, but Dominicanese confounds me: the substitution of “l” for “r” so that “por que” becomes “pol que”, and the shortening of almost all words. I have added some Dominicanismos to my vocabulary: “Bi Ma” is “Big Mac”; “Beiball” is “baseball” (an important one); “sicote” is “smelly feet”; and someone who talks without thinking is a “boca de agua.” Despite my new arsenal of knowledge, I still agree to a ladle of kachu and end up with a mouthful of ketchup. But I applaud myself for avoiding this fatal flaw: asking for a “bolsa” at the mercado. In Mexico, bolsa means “sack,” but in the Dominican Republic it is a part of the male anatomy. Dominicans say funda and so do I. Brilliant yellow and blue stores line the streets of La Romana. I ramble around, putting the fuku behind me. I do not cross my eyes while a rooster crows (an easy one since I arise well past dawn). I have a café con leche and savor it while sitting down. To drink it standing up might bring bad luck. Shop-keepers in La Romana are wise: when cleaning up they do not sweep the dirt out the front door, which would wipe away all their profits. Maybe that is why the town has almost 100% employment (atypical for the Dominican Republic). More likely it is because the Central Romana Corporation owns most of La Romana, a company town since 1917. La Romana also rolls out three world famous cigar brands: Montecristo, H. Upmann, and Romeo y Julieta. In recent years, tourism has become a serious competitor. The Carnival celebrations begin early with children scampering about in plastic Halloween masks. Carnival means “goodbye to meat,” the last big hoorah before 40 days of Lenten abstinence. The celebrations were carried to the New World by Southern European colonizers. In the Dominican Republic, which is 95% Catholic, African and indigenous Taino cultures changed the focus. Dominican masks, rather than being the disguises of the Venetian Carnival, became a way to transform the wearers into supernatural spirits. This metamorphosis probably arose from African traditions. The exuberant parades of Carnival likely also arose from Africa, where circling in parades traditionally brought good fortune, resolved problems, and calmed down angry ancestors. Display of plastic halloween masks worn by kids. Politics also helps to explain the origin of the Dominican carnival. Originally named Hispaniola by Columbus, the island was claimed for Spain in 1492. The Taino had another name: Quisqueya (“Great Land”). But the Taino suffered from fuku of cosmic proportions. Wiped out by smallpox and enslavement, their influence persists: most Dominicans claim Taino ancestry. Santo Domingo, founded in 1496, is the oldest city and probably the first place where Carnival was celebrated in the New World. The city was also the seat of the Spanish Empire in the Americas until conquests in Mexico and Peru moved the lust for money farther west. Several hundred years of turmoil followed. Haiti had control of the island during the “Haitian” occupation (1822-1844), political squabbles that continue today. The U.S. engaged in intermittent meddling when U.S. Marines took over the island from 1916-1922 (a widely unpopular move). Then came 30 years of repression by Trujillo, who murdered and tortured his way to the top. In a fit of self-worship, he re-named Santo Domingo “Ciudad Trujillo”. A fan of skin whiteners, Trujillo stigmatized African ancestry and aggravated the conflicts with Haiti. The country did not fare much better under his successor, Balaguer, who strengthened the infrastructure at the expense of 12 years of human rights abuses. The grand legacy of these guys is the Dominican diaspora, largely concentrated in New York City where more than 670,000 Dominicans live. In the U.S., roughly 1.8 million people are of Dominican descent. No wonder the island’s streets come alive during Carnival, a vibrant celebration of life and Dominican culture. Each town parties on a different weekend throughout February. 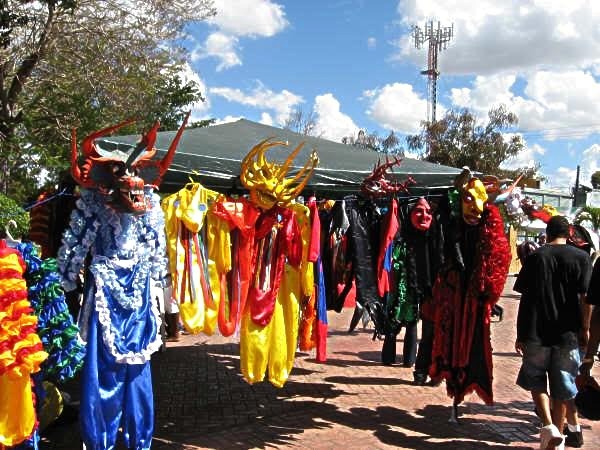 The costumes also vary from town to town and represent a pantheon of mythical beings. The masks are amazing. They were originally made from discarded slaughterhouse materials: leftover teeth, hides, and horns. Traditionally, a mask’s mold was made freehand from river mud, and then dried in the sun. Cattle horns provided the framework for the devil’s horns. Old newspapers or brown paper bags were applied in layers up to eight deep, while yucca mixed with lime (to keep it from spoiling in the tropical heat) became an adhesive. Finally, the mask was sanded and brought to life with brilliant paint. As night falls the party picks up. Party goers clog the streets and Presidente flows freely. I roam from stand to stand, sampling street food: pastelitos (meat pies), chicharrones (fried pork rinds), fried yucca, pasteles en hoja (ground yucca wrapped in plantain leaf), and frio frio (snow cones). Gangs of costumed teenaged boys prowl the crowd and menacingly wield vejigas. A group of screaming girls tries to escape and nearly starts a stampede. My fuku is preoccupied and momentarily forgets to haunt me. But I keep an eye out for zaganos (magical creatures who fly amazing distances in the blink of an eye), and ciguapas (enchanting beings who lure people into the forest where they become lost: ciguapas have backward facing feet so their footprints point in the wrong direction). The next morning I wake with a searing hangover and run straight to the beach. The gentle ocean cures the headache and lightens the weight of the fuku, some of which has already seeped away during Carnival. But on my last day, the fuku returns. I lose my keys, and wonder if it is the duendes (spirits of unbaptized dead children who run around at night, giggling loudly and wreaking havoc). On the Island I learned critical tactics for keeping the fuku at bay. Back in the States, I hang aloe over my door to absorb the bad energy of people coming and going. I place bells by my door to ward off evil and give advance warning if spirits enter. I refuse to open the fridge after ironing. If Columbus comes up in conversation, I do not say his name (which brings bad luck) but call him “El Admiral.” I take baths in rose petals to quitar la mala suerte (get rid of bad luck). And this winter, during the week before New Year’s I will place a cubo de agua (bucket of water) in the farthest corner of my house. Then, exactly at midnight on New Year’s Eve, I will dump the water out the back door. This gathers all the bad spirits and feelings of the previous year, and drains them away. If it does not work, I might need to soak in more Island water.